My cousin who is a great cook recently shared this recipe using rice. I tried with millets and the result was so yummy! The preparation is very simple and is suitable for breakfast, snack or dinner. 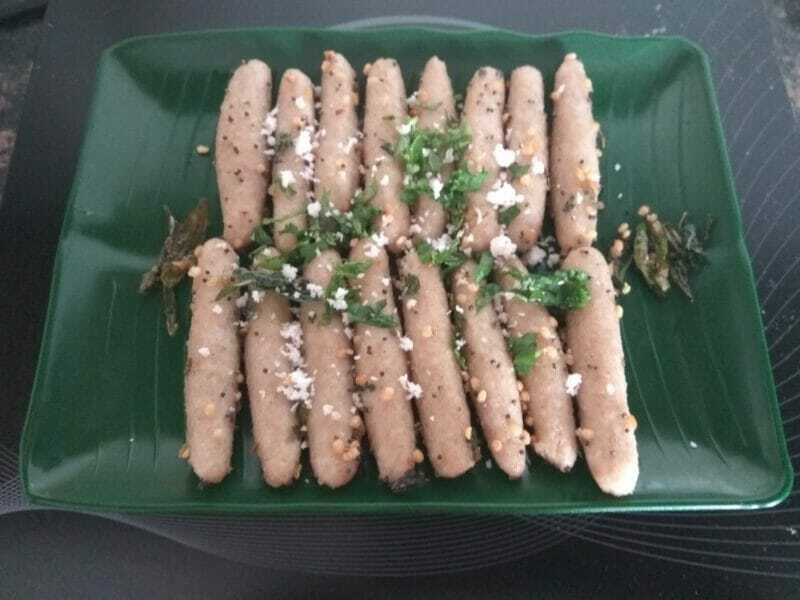 Leftover cooked millet can be used for this recipe. Pankajam, thanks for sharing an awesome recipe! Mix cooked millet, flour, salt, chilli powder and green chillies. Knead well to make a smooth dough. Divide into marble size portions and shape them into long sticks. In a pan add enough water and heat. When it starts boiling, reduce the heat, add the sticks and cook till they start floating on top. It may take 10 minutes. Switch off. Remove the sticks and allow it to cool. In a pan heat oil and do the seasoning. Add the sticks and toss for 5 minutes on medium heat. Switch off. Sprinkle grated coconut and serve with green chutney. Add salt, asafoetida powder and buttermilk to the leftover water. It becomes a porridge drink. 1. Any cooked millet and millet flour can be used. 2. Can add grated carrots instead of coconut. Thanks a lot for ur healthy recipes my family enjoys it all. Looking forward for new recipes. I’m very happy to know that your family loves all these simple millet recipes. It really motivates me to come up with more in the future. Glad to know that it came out well and your family enjoyed this simple healthy recipe. Thanks so much for sharing your experience. Glad to know that you like my simple healthy recipes. Please share your experience when you try anything. Thanks so much for your motivating words. Your recipes are too good. Learnt lot of healthyillet cooking from your posts. Thank you so much. Glad to know that my posts are helpful to you. Thanks so much.